We’re all about the big breakfasts here at 12 Tomatoes, especially when bacon and potatoes are involved! 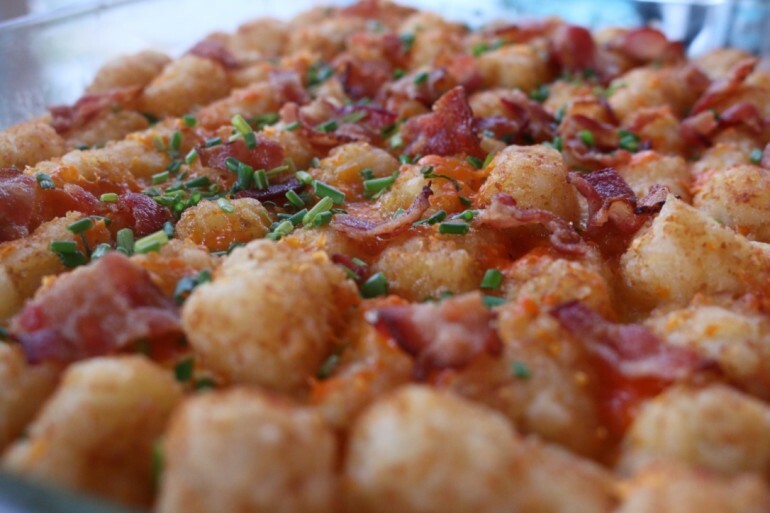 This loaded tater tot casserole from our friends at Spoon University just might be one of our new favs. With layers of everything we love from the crispy bacon and gooey cheese to the creamy eggs and tots, you really can’t go wrong with this one! In a bowl, whisk together eggs, milk, salt, and pepper. Then pour the mixture over the cheese so that it is evenly distributed. Layer the top with tater tots and place the pan on the lower middle rack in the oven. Bake for 35 minutes. Take out breakfast bake and sprinkle additional ½ cup of cheese on top. Then place the tray back in the oven for 5-10 minutes until the tots are golden brown and the sides are bubbling. Add bacon bits and chives to garnish.